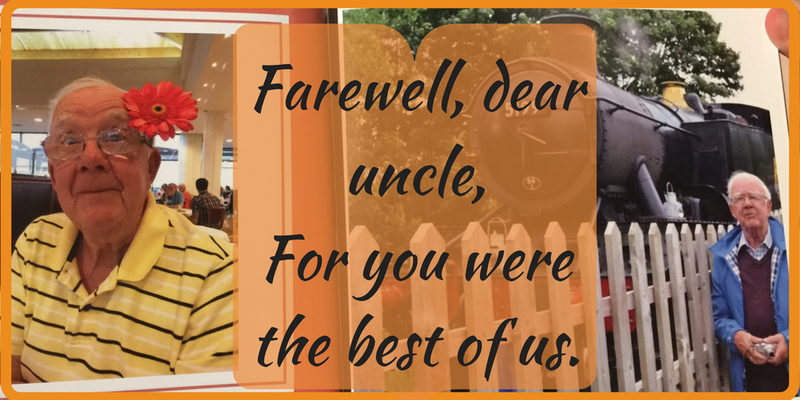 A Life, Not As Advertised: Farewell, dear uncle, for you were the best of us. And so farewell Uncle Ray, farewell. Though we shared no blood, I knew you every day of my life that I can remember, and then some. You grew up next door to my mum, a friend from as soon as she could boss you about, though in a nice way, I'm sure 😉. You were mad about trains, a passion that stayed with you for life. You are in my earliest memories when, as a child, I would regularly pop next door for some pop and to visit. When staying at my beloved Gran's house, I would wave good morning through our respective kitchen windows that faced each other at the back of the terraced houses in a working class suburb of Manchester. Backing on to cobbles, many of the yards ended in a narrow path beside the length of an asbestos-built garage, including yours and my Gran's. Small surprise then, I suppose, that you succumbed to lung cancer, even though you were never a smoker. You lived with your mother until middle-age. I barely remember your father but you stayed in your childhood home, helping your mum, my gran, my mum, countless others, through your electrician's skills. You married late, to the sister of a former fiancé of my mum's she had introduced you to. Rosemary had two daughters already and you took to fatherhood as you did with everything, with dedication, loyalty and steadfastness. They called you Dad, loved you easily and their children were your grandchildren. It was a life of two halves and I wasn't around for much of your married life, other than visits at Christmas and whenever. When I had my children, you excitedly took them up to your loft where you had constructed a boy's dream of train sets; for that alone you took on hero status, let alone the chocolate on the Christmas tree always waiting for them as it had always been each year for us. You never forgot a birthday or Christmas, complete with a cheque or crisp note tucked inside. Through it all you were cheerful, stalwart, helpful and there. You were there. When my Grandad died unexpectedly, in front of my 12 year old self and my Gran, you were there. When my Gran died, equally unexpectedly, you were there. When my mum got ill with cancer, you were there. When her husband died, you were there. When she died later the same year, you were there for me and especially my sister in the months before and after as she cared for my mum and cleared the house. You were there for good times too of course, it's just that who stood by you in your difficult times are the ones you remember most. Your passing is the end of an era for me, the last link to my Gran. I know they were there waiting for you when you passed. My mum, my Gran and Aunty Dear, your mum, whose poor feet I seemed to trip over so often as a child, that as soon as I stood up my Gran would call out, "Mind Aunty Dear's feet, Tania!" I can't speak much for your life as a family man, other than to know that you loved, and were loved, by all. You were the best of men, Uncle Ray. Quiet, unassuming, cheerful with an understated charisma that led to today's packed crematorium full of people whose lives you touched and who held fond memories. A humanist service celebrated your life, filled with loving memories and stories of holidays, helping others and, of course, of trains. No sombre hymns, it was John Denver who saw you out, in your coffin painted all over with steam trains; a perfect ending to a fulfilled life, well lived. Just as you would have wanted. 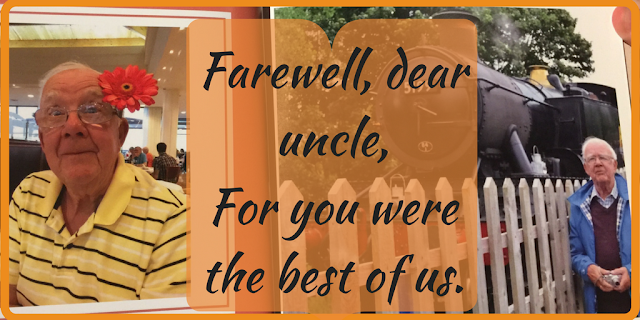 Farewell, then, Uncle Ray, farewell.